EK-M.2 NVMe Heatsink is a passive heatsink for M.2 NVMe Next Generation Form Factor SSDs. 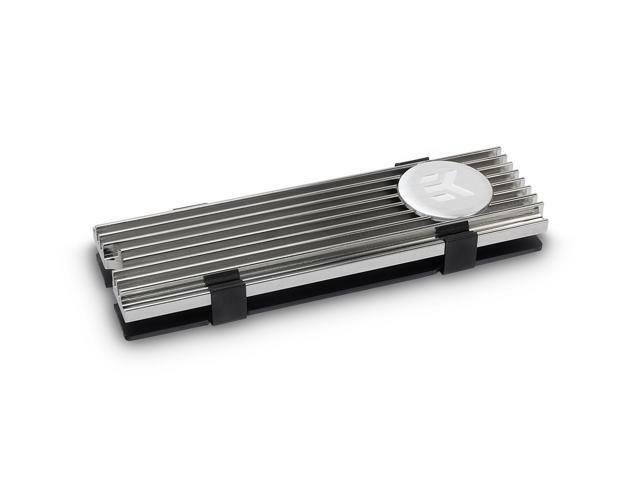 It is a much needed aesthetical and functional heatsink for many PC owners. It is not a secret that M.2 NVMe SSDs can overheat very easily and be subdued to thermal throttling, thus losing performance. The heatsink brings 7-30?C improvement in SSDs temperatures, or even more with sufficient air flow. The unique design of the heatsink ensures that it is easy to install, it is low profile, easily reusable and aesthetically not intrusive. Simple clips ensure that the heatsink is very easy to install and to re-use if the SSDs is upgraded. The heatsink is ribbed, so it`s not just a flat aesthetical cover, it also acts as a very effective passive cooler. Its simple design ensures a sleek, non-intrusive look that can be easily combined with any aesthetical requirement of the user. The compact design makes it highly compatible so that it does not interfere with other components. EK Water Blocks are offering the new EK-M.2 NVMe Heatsink in black and nickel variants. The EK-M.2 NVMe Heatsink is compatible with all single-sided type 2280 M.2 NVMe SSDs (22mm wide, 80mm long). Because the heatsink consists of a front and backplate as well, the compatibility is limited to M.2 (NGFF) connectors of 4.2mm height (as seen from examples). Model: 3830046991799. This item is covered by EK Water Blocks Return Policy. Other Thoughts: After reviewing three M2 heat-sinks (the M2 technology is new to me, the last time I built a rig it wasn't available), I opted for the EKWB heat-sink. Newegg had the best price and quickest shipping, this installed on my Western Digital Black 250gb NVMe stick with little issue. I haven't ran the drive without it, so I cannot confirm what the temps are bare. As stated, it comes with two thickness strips of thermal tape material and a simple instruction picture. My WD drive's chips were all the same thickness on top so I didn't run into any issues when installing the clips. Just use care, and ensure the two clips install in the small cut outs on the bottom flat metal portion of the heat-sink (that will make more sense when you have it in your hands). Those who say the clips are tough to install, probably didn't have them lined up properly. No fit issues with my Asus Prime B450M-A/CSM mainboard. I would recommend this simple passive device to anyone installing a M2 drive. Cooler is better, and for $14, it's cheap insurance against a $150 drive. Pros: It does what it should. Looks good and wasn't hard for me to put on despite what others said I found it to be pretty straight forward. Came with directions although for my application I did not follow them. Cons: Depending on machine type you are planning to use this with could be some clearance issues. Other Thoughts: I put this on a HP EX-900 in an HP Probook laptop. With back plate and clips it would make the drive bend. I cut the thin thermal pad to size for the chips on the drive and mounted the front plate. Just used small bands to hold it to the board. Actually makes it look even better. Pros: It cools the SSD, which helps performance. Cons: It is extremely difficult to install. I recommend avoiding this product, but if you must get it, watch a few YouTube videos to learn how to install it. You see, the clip system that holds the assembly in place is extraordinary difficult to set up without scraping or permanently damaging your SSD. I regret buying this product, as it took me 20 minutes to install, and the cheap thermal pads fail apart. Pros: Easy to install/Take off. Included thermal pads are quality. Slot 2 for M.2 on my mobo makes 2-3 space GPU's ride over the socket, this heatsink did not interfere with any card placement, and in fact is VERY slim. Didn't see it came in black til I had it installed for a week, but nickel looks fine in my black/white build. Other Thoughts: **Backplate: This could be an issue for double sided memory drives , the included thermal pads are 2 thicknesses and the larger may be too thick on the one side, a thinner pad may be required for proper seating with the clips, and there isn't enough of the thinner size included for both sides. FYI. Tested on a Corsair MP300 480 gb, without and with My temps went from 60-62c down to 48-50c under 3 stress tests, with CPU/GPU tests running to generate more case heat. All in all this VERY slim heatsink made a noticeable difference and I would recommend it to anyone who has issues with M.2 drive temps that has standard MOBO socket clearance below the drive for backplate. Cons: Faulty clips. I use a plier to reshape them. May be one of the thermal pads is too thick. Other Thoughts: The thermal pads are single sided sticky. Stick them to the heatsink and the backplate. Cons: Before the unit was installed, I'd max at 111F to 116F. I just installed the unit and am right at 111F... I would not spend your money on this cheap unit.